MK Alagiri Rally: Expelled DMK leader and his supporters going towards Karunanidhi memorial. Expelled DMK leader MK Alagiri and his supporters were in black and white today as they took out a "peace rally" to the memorial in Chennai of his father MK Karunanidhi, who died last month. Mr Alagiri, the older brother of DMK chief MK Stalin, later claimed around 1.5 lakh people participated in his march to Marina Beach, widely seen as a show of strength. Red and black DMK flags fluttered in the hands of Mr Alagiri's supporters, a sign that a section in the crowd did include workers of the party. In a strong message to him, the DMK on Monday suspended a local leader who had received Mr Alagiri at the airport. "1.5 lakh people came here to support me today. Will they send all of them out? You ask them and let me know," Mr Alagiri said as reporters asked him about the DMK punishing his supporters. Mr Alagiri, 67, decided to go ahead with the march days after declaring that he was ready to accept his younger brother's leadership if he was taken back into the DMK. Mr Alagiri, the eldest son of former chief minister and DMK patriarch Karunanidhi, was expelled in 2014 for anti-party activities after he openly rebelled against his father for projecting his brother as his successor. He had said that he would not accept anybody but Mr Karunanidhi as his leader. After Mr Karunanidhi's death on August 7, Mr Alagiri, who had been in virtual political hibernation for four years, surfaced at his funeral. He made it clear that he wanted back into the DMK but kept making contradictory statements, alternately lashing out and softening his stance. One day he claimed that loyal DMK workers are with him, the next day he threatened the DMK with serious consequences if he was not re-inducted. Last week, the former union minister said: "We are ready to join the DMK... It is obvious that I accept him (Stalin) as my leader." DMK sources say there are no plans to bring Mr Alagiri back into the party. New party chief Mr Stalin is dead against taking his brother back. 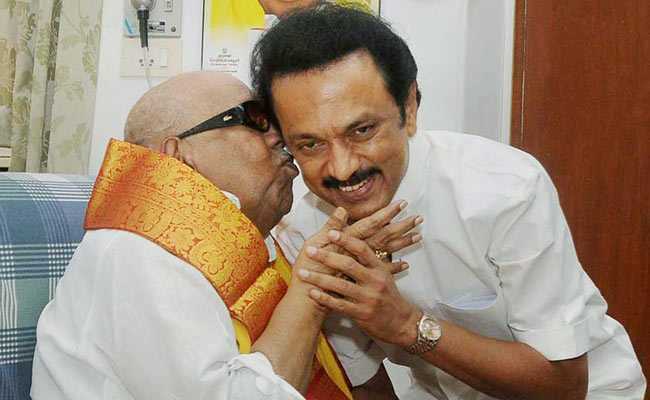 Mr Stalin was recently elected unopposed as DMK president; he has complete control over the party he ran for years on behalf of his wheelchair-bound father, who was DMK's chief for five decades and who groomed his younger, more politically adept son to take over after him. Within a few days, Mr Alagiri's tough talk was back. "I am Thalaivar's (late DMK chief M Karunanidhi) son, so I will do what I said," he told reporters on Sunday, when asked whether he would still hold his rally.